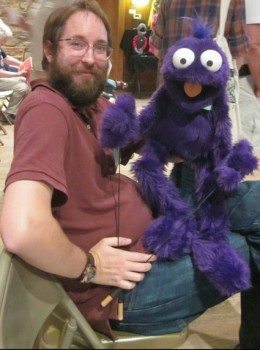 If you are looking for a unique class at the Folk School that incorporates visual art, mixed media, and performance into a week of puppet fun, check out David Stephens class Hand-and-Rod Puppet Construction (April 10-16, 2016). When David teaches his class, an infectious feeling of whimsy, fun, and joyful energy permeates the campus. 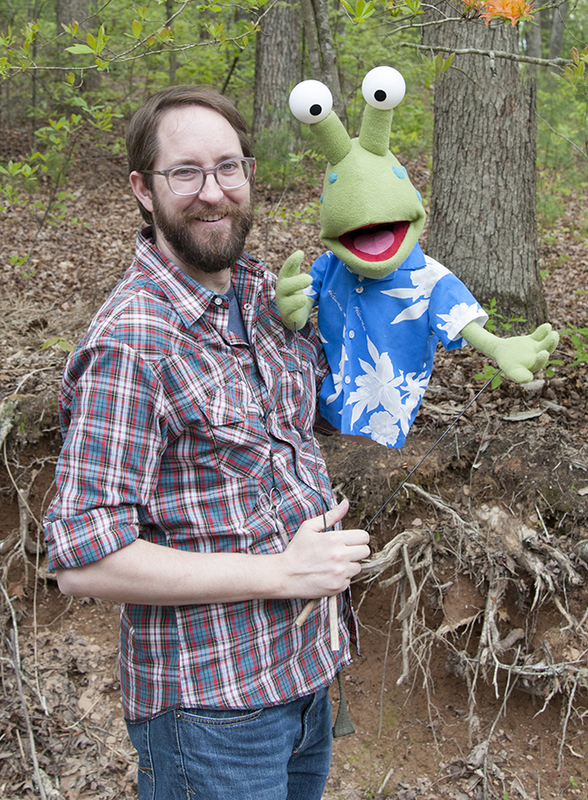 David has been a puppeteer and puppet maker for over 20 years and is founder of All Hands Productions in Atlanta, GA. I sat down with David during his last class here at the Folk School to find out a little more about the magic of puppetry. CP: Is the person who creates the puppet usually the puppeteer? DS: Some people are just builders, and some people are just performers. I do both and I feel like I am a more informed builder, because I am a performer, and vice versa. Understanding the mechanics of how the puppet is made makes me a better performer. Thinking like a performer makes me a better builder, because I know what I want the puppet to be able to do. It can be a symbiotic relationship. I like the visual art aspect just as much as the performance part. Making a puppet from scratch is very gratifying. You take this idea in your head and realize it in three dimensions, which is pretty cool. CP: Describe what a week is like in your Hand-and-Puppet Construction class. DS: For the first few days, everybody is making the same basic form. By the end of the week, students are creating their own characters, using their imaginations to come up with different facial feature combinations. The personalities of the puppets start to come out later in the week. You see this extreme change in the room from things that look very much the same, to very distinct looking characters. 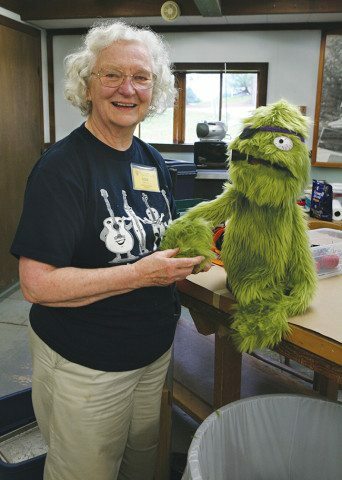 The difference between the puppets that I make and the puppets that these students make is about 20 years of experience. We are all working with the same basic pattern. Experience is the only difference; otherwise we are making the puppets from exactly the same patterns and materials. 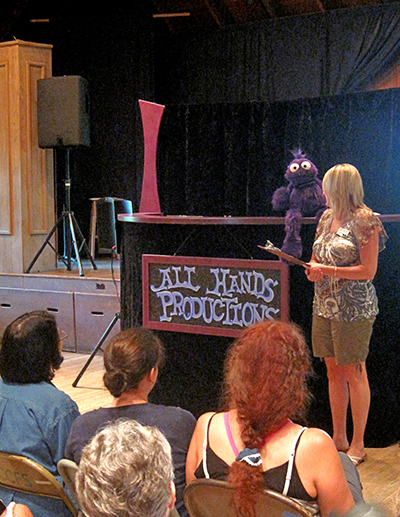 Tammy and Norbert kick off the puppet show in the Community Room. CP: Who can take this class? 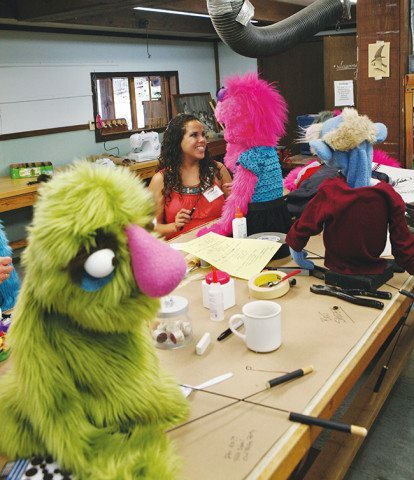 DS: This class is really for anyone interested in puppetry. You don’t need any prior experience. 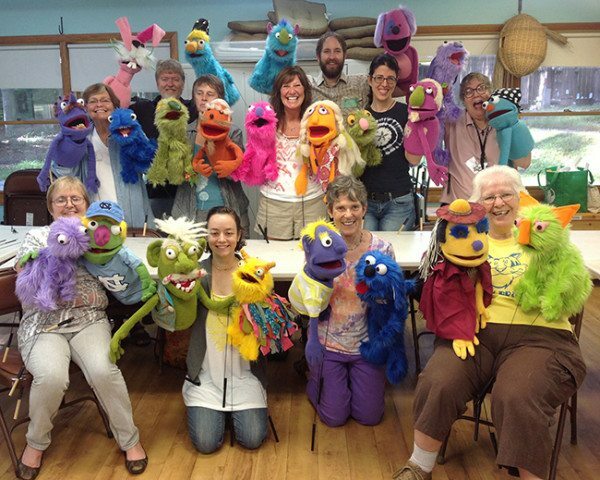 Many folks who take my class don’t have very much (if any) puppet making experience. Everyone will walk away with a character they have created, and a puppet they can use. CP: Who’s the most meaningful puppet you’ve created? DS: Probably Norbert. Norbert is this furry purple monster who I created initially around 2003. He was just in a group of generic monsters. I started using him to do public appearances and the more of those I did, the more I got know about the character. Kids would come up and start talking to the puppet, and it’s not like I had any sort of backstory for Norbert written down, but as kids would ask him these questions, he would just have answers. His character naturally developed, and he’s the one I feel most comfortable using. David demonstrates the ancient art of puppet eye insertion. DS: Puppetry is this great combination of craft, art, and skill. 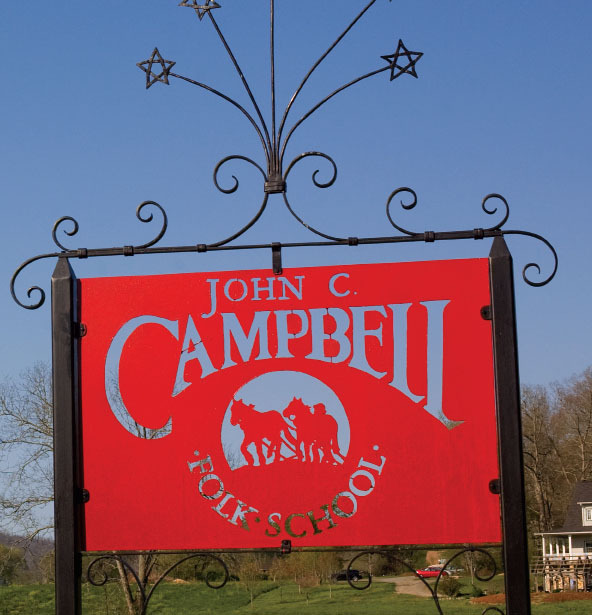 We use various aspects of fiber arts, woodworking, figurative sculpture, and storytelling– puppetry uses a lot of different craft subjects you find at the Folk School in one form. 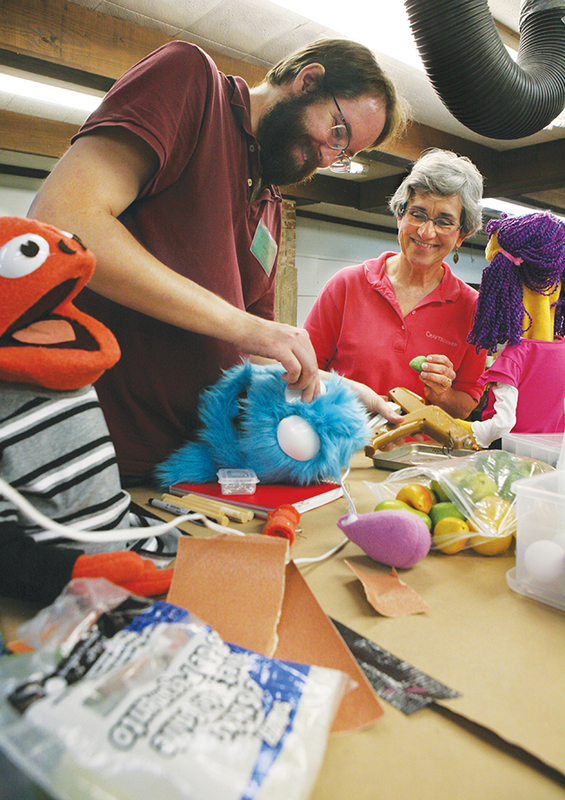 I don’t teach very often, and I hope is that my class makes the process of creating puppets more accessible. Everybody seems to have a great time in the class, despite what their expectations or limitations may be. All the students seem to be very surprised by the end of the week. Even though I show them what we are going to do, there’s still this moment when they realize what they’ve done over the last four days. They have created this thing from nowhere, and now they have this physical character they can take home with them. It’s a great feeling. CP: Your class Show and Tell displays really make a wild impression on people. How do people react to the puppets? DS: People instantly gravitate toward puppetry. People will come to Show and Tell and see all the puppets and express how they wish they had taken the class. 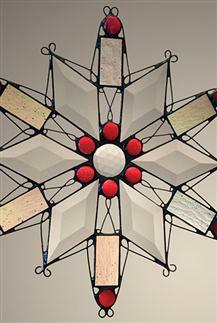 It’s incredible to see what the students make and I find that to be a wonderful part of the Folk School. Even though the Folk School stresses the process more than the completion, the students still get to complete the process, which in my class, is the creation of the character. It’s one thing to make a puppet, but the moment when you start to put some thought into it like, “Who is this puppet? What is this puppet? What is this puppets story?” is the moment when you start to create the character. That’s also part of the process for me and the class. It’s not just about cranking out puppets. It’s really a character-based process and that draws people in. CP: Your class is about Hand-and-Rod puppets. What are other types of puppetry? DS: Oh yeah, there are all kinds of styles! There are big over-sized parade puppets, traditional glove puppets, shadow puppets, marionettes, string puppets, rod puppets, finger puppets, body puppets where you wear the suit. 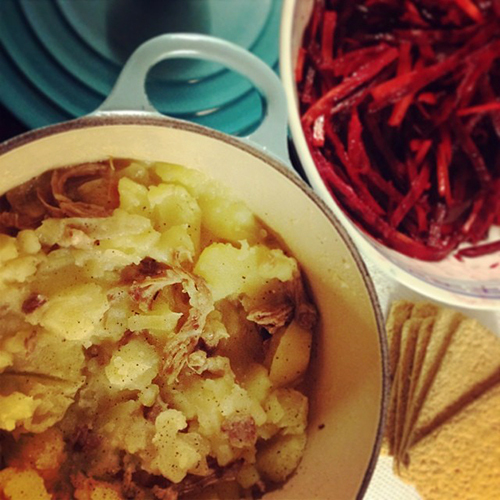 Hand-in-rod is a popular style. CP: Do you have a favorite performance? DS: My favorite show was performing for the Helen Keller School in Alabama. I didn’t know how it would work, because they told me that half of the children would be blind, and half would be deaf. Puppetry is a visual art form, and my shows are very verbal and full of dialogue. I gave the interpreter a copy of the script. Those children were probably the most receptive, responsive, and gracious audience I have ever had. 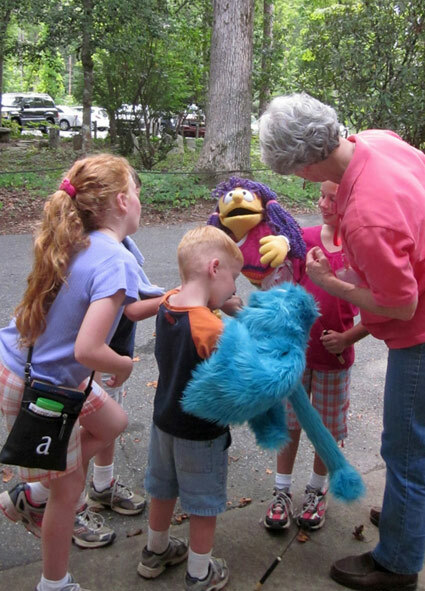 After the show, the blind children got to come up and touch the puppets. I was amazed that the humor still worked in the exact same places. That’s what surprised me the most, it played exactly like any other audience, and they were so wonderful. CP: If you were a puppet, who would you want your puppeteer to be? DS: Good gracious. In the pantheon of puppeteers, hmmm…. Well, I’m a Muppet nut, so of course it would be an honor to be a puppet that was performed by Jim Henson, or Frank Oz, or any of those guys. I have my own personal favorite puppeteers that nobody’s ever heard of. A student with her fuzzy green pirate-patch puppet. 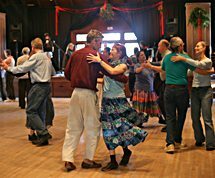 CP: Well this is you chance to make them famous on the Folk School Blog! DS: My puppetry mentor Terry Snyder from Richmond, VA. I met him when I was in high school, and I saw his one-man shows. He blew me away, and inspired me to want to become a solo puppeteer. He is also one of those puppeteers who builds and performs and is informed in both of those things. He is just a fantastic artist. We’ve had a friendship for 20+ years now. His shows are magical and I think the best puppeteers bring a part of themselves to the work that they do. CP: What’s the puppet scene like in Atlanta? DS: It’s amazing! Atlanta is the puppetry oasis of the South. The Center for Puppetry Arts has been based there since 1978. The Center has two theaters, an education department, a private collection of Jim Henson’s work, and a global collection of puppets. They do lots of educational programs for children. It’s a pretty amazing and one of the only places like it in the country. 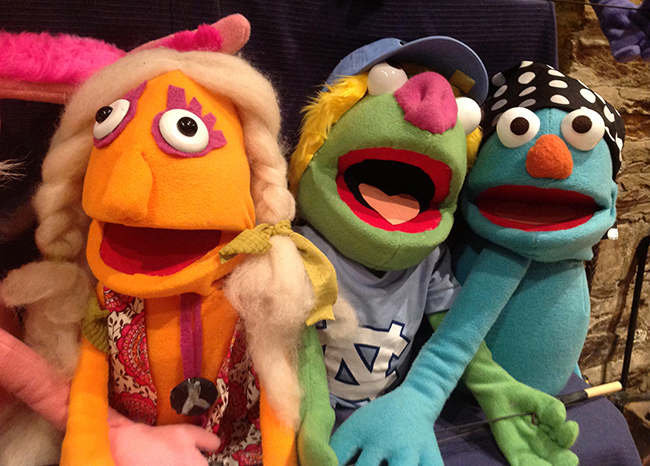 Independent of the Center, there’s a healthy puppetry community. There are performers and enthusiasts. CP: Do you consider yourself an activist, or do you try to convey a specific message? DS: I consider myself to be pure entertainment. With my work, I want to give my audience a space for relief, where they can check their troubles at the door and just spend 40 minutes laughing and enjoying the show. I want people to leave the theater thinking, “Wasn’t that great!” I want to tell a good story and for the audience to have a good time, but not for any specific educational or didactic reason. A variety of characters from David’s classes at the Folk School. 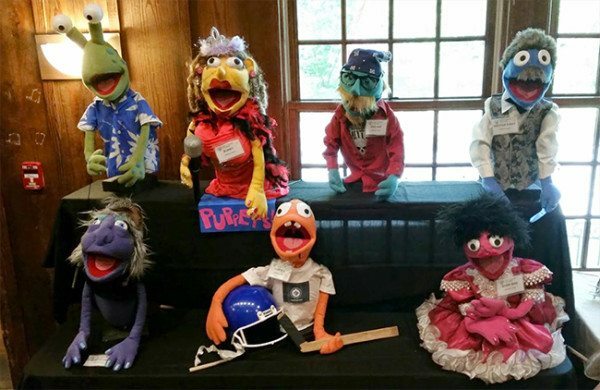 CP: Who was your favorite guest star on the Muppet Show? DS: Good question! Boy, I’m trying to think of the one I go back to and watch the most. Loretta Lynn was great because she sang a bunch of her songs. Instead of filming it on the theater set, they claimed that the theater was being fumigated and they did the whole show at a train depot. That’s a good one! Also–Johnny Cash one! I loved the character named Big Tiny Tall Saddle. Big Tiny was performed by Jerry Nelson, a longtime Muppet performer, and a friend of mine before he passed away. Jerry was the most generous, sweet, kindhearted person, and Big Tiny Tall Saddle was the meanest, most ornery guy. It’s fun to watch a puppeteer play against their own personality and create a character that is so outlandishly far away from who they are. That’s part of the fun of it! Create your own original puppet character while learning professional techniques for soft-sculpture construction with rod mechanisms. Puppets will be made using a variety of materials, including foam rubber, fleece, and fur fabrics, and constructed by gluing and hand & machine sewing. Only a healthy imagination and basic sewing skills are needed. Note: Additional materials fee is estimated at $150. Amazing! Can’t wait to take this class!